“There are no other Everglades in the world,” Marjory Stoneman Douglas, 1947. Sept. 10 and 11 of this year, Hurricane Irma ripped through much of Florida with the Middle Keys and Southwest Florida taking the brunt, including Everglades National Park. Thanksgiving Weekend, my dog Radcliff and I hopped in the car and traveled fromEverglades City to Flamingo (west coast to east coast, if you’re not familiar) to see what’s open in the Everglades. Despite seeing trails and some businesses closed, I was happy seeing much of the national park and many surrounding businesses open and ready to welcome visitors. Problem is, many potential visitors think the park is closed or too damaged to be enjoyed and this is not true. The community has really pulled through, with assistance from professional tree removal companies, water damage experts, electricians etc. There is still a lot of work to be done, but it’s far better than I imagined. Chokoloskee, Fla., About 2 Months Following Hurricane Irma, Nov. 2017. My eyes watered with sadness as I drove through Everglades City on my way to Chokoloskee and spied the piles of debris sitting by the road, eyed blue tarps, and saw some closed businesses with obvious damage. The manmade hills of trash were made of toilets, bedding, and a mish-mash of what were once personal effects and home fixtures damaged by the storm’s fury waiting to be hauled away, more than two months following the storm and it was reassuring to see people help each other to fix what they could, even though you wish they had a service similar to ServiceMaster Restoration by Zaba to help them. It was a sad scene to absorb. It was bound to happen, although I did not think it would be so soon. Everglades National Park was hit with yet another devastating hurricane. The last two were Hurricane Katrina in 2005 and Hurricane Wilma in 2004 which caused so much destruction that the Flamingo Lodge, the then only lodging in Everglades National Park (a place I called home for several years; currently, there isn’t any lodging inside the park), was damage beyond repair and was razed. What Irma dished out seemed more devastating damage-wise than the previous hurricanes. Charles Wright, Owner of Everglades Area Tours in Chokoloskee, Fla. The journey began with a visit to Everglades Area Toursin Chokoloskee which is the western gateway entrance into the national park. I met with owner Charles Wright who discussed the local damage, estimated storm surge of 6 – 9 feet, and what his tour company offers. I interviewed him for my radio show but since our conversation was longer than my show’s allocated 20 minutes, I have uploaded the interview to SoundCloud where you can listen. I have not taken one of the 23 Everglades Area Tours experiences yet, but they are high on my list and hope to do so in 2018. Specifically, there’s a hiking tour Charles describes as probably the best but the least utilized. There are also experiences where you hop in a motorized boat with kayaks to get deeper into the Everglades in a shorter period of times. Sounds awesome, right? And, he has a tour that leads participants to the ghost orchid habitat. Everglades Area Tours has been in business since the late 1990s and are a Certified Eco Provider by the Florida Society of Ethical Ecotourism. It was then off to the main entrance to Everglades National Park located in Homestead and rather than taking I-75, I drove along my favorite scenic route, U.S. 41, the Tamiami Trail, where I saw more of Hurricane Irma’s impact. Joanie’s Blue Crab Cafewas open along with Clyde Butcher’s Gallery,the world’s smallest post office, Skunk Ape Headquarters and several airboat operators. Businesses are few and far between along the drive and the Shark Valley entrance of Everglades National Park was closed in addition to at least one campground in Big Cypress National Preserve. Because of that, he put up a sign reading “Robert is Here,” so customers did not need to wonder. In 1960, his produce stand was established and has been growing strong ever since. I have been going to that exotic fruit stand since working in the park (back in the ’90s) and the one thing I always get is a tropical fruit milkshake. This visit it was a strawberry and key lime shake. Although the stand has grown up a little bit since I was last there about 5 years ago, one thing has not changed, it’s old Florida charm and yes, Robert WAS there! The disappointing part of my visit was I arrived just after 6 p.m. and had to pay a $5 cover charge to enter the tasting room to purchase $50+ worth of adult beverages. I was told it was to cover karaoke, etc., in which I was only visiting the tasting room and was there less than 10 minutes. Whatever. Although I really enjoy the wine and the Shark Bat Mango Wheat Beer is mighty tasty, I’m not sure whether I’ll make it a point to visit again. Charging people $5 to go in and make a purchase is silly. At least give the customer a $5 credit or a wine tasting, even if it’s one wine. A Walk Through a Dwarf Cypress Forrest in Everglades National Park, Nov. 25, 2017. After a night in Miami, it was back to Everglades National Park where I stopped several times along the way to the end of the road to Flamingo (about a 90-minute drive from Miami to Flamingo). I ended up noticing and appreciating parts of the park I had not noticed before. I stopped at a short boardwalk in the dwarf cypress forest and watched gar fish feed and spotted two green anoles. It reminded me how special Everglades National Park is. It was established for its biodiversity and takes patience to appreciate. It’s not one of those parks that will “wow” with geology, because it’s lacking, but life teeming in ecosystems will capture your heart. I did a little bit of walking in the Long Pine Key Campground with Radcliff and realized I had not spent much time there. Many campsites were full, either with tent campers or RV/motorhomes. West Lake was the last stop at the end of the road with bathrooms so I made a pit stop and let Radcliff stretch his legs and peer into the water. After seeing a sign about not feeding crocodiles (not alligators, CROCODILES), I was overly cautious and kept my eye on him and the tannic water in case a croc was eyeing my dog for lunch. Radcliff Cautiously Looks Into the Water at West Lake in Everglades National Park, Nov. 25, 2017. In Flamingo, well, I was not as shocked as when I have visited since 2008. The parking lots were full with boat trailers and trucks and obviously, Flamingo is still a popular fishing destination. I also heard several different languages being spoke by people in the Flamingo marina basin. Manatees rolled in the Florida Bay side of the marina basin and I learned it’s manatee mating season. Over on the Buttonwood Canal side of the marina, by the “plug,” the device that separates Florida Bay from the Buttonwood Canal, mangrove debris gathered in the corner and a large American crocodile was hiding under the branches. 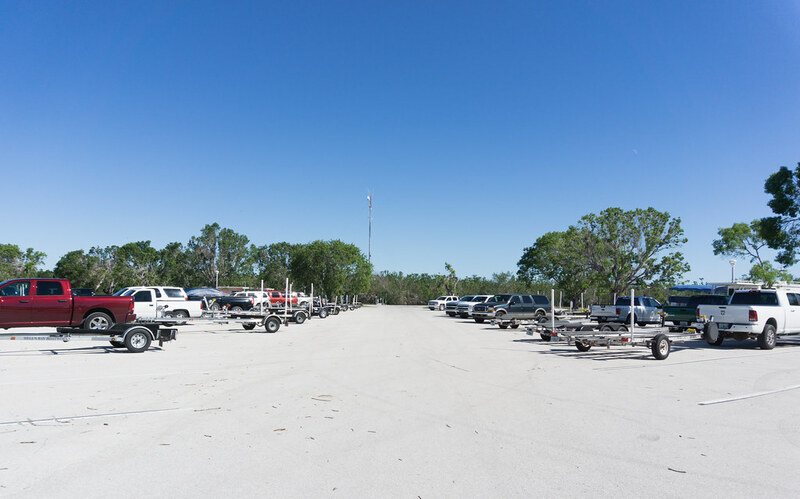 One of the Parking Lots Full of Boats and Trailers at Flamingo Marina, Everglades National Park, Nov. 25, 2017. The distinct cries of the osprey called out and I saw two pairs of nesting osprey in the marina basin. I also spied roseate spoonbills, one of my favorite birds for their bright pink feathers, flying in the blue sky. Other than that, Flamingo was like a ghost town. The road to where the former lodge was located, Eco Pond and the Flamingo Campground, was closed off. Access to the former Flamingo Restaurant, Buttonwood Café, gift shop and Flamingo Ranger Station were also closed off, although it was easy to walk over the downed caution tape. There is a daily national park service ranger program. 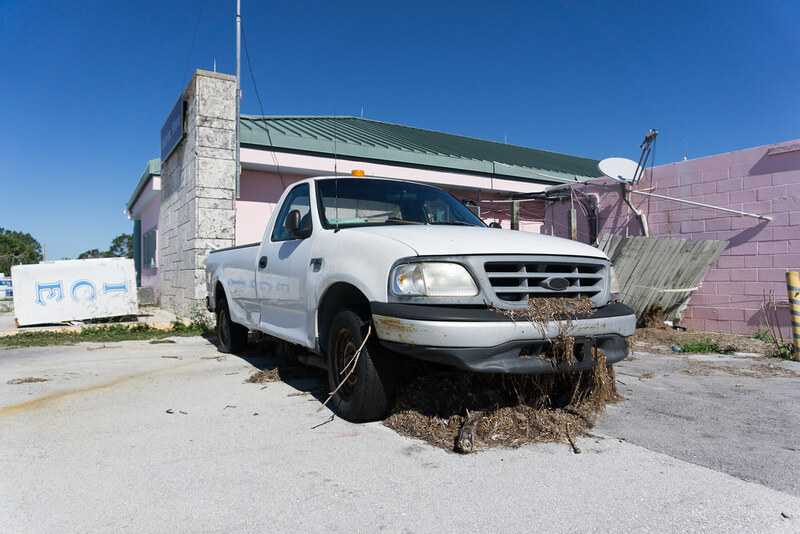 A Truck with Dried Sea Grass Outside the Flamingo Marina Store, Everglades National Park, Nov. 25, 2017. The Marina Store, where I spent a season as the store manager, was still there, but, it looked as though the storm surge washed over the entire area. There was dried mud around the store and looking through the glass inside the store, it looked as though a cleanup had been attempted. Clumps of dried sea grass dangled from a pickup truck and gas pump. The kayak and canoe racks were empty skeletons. 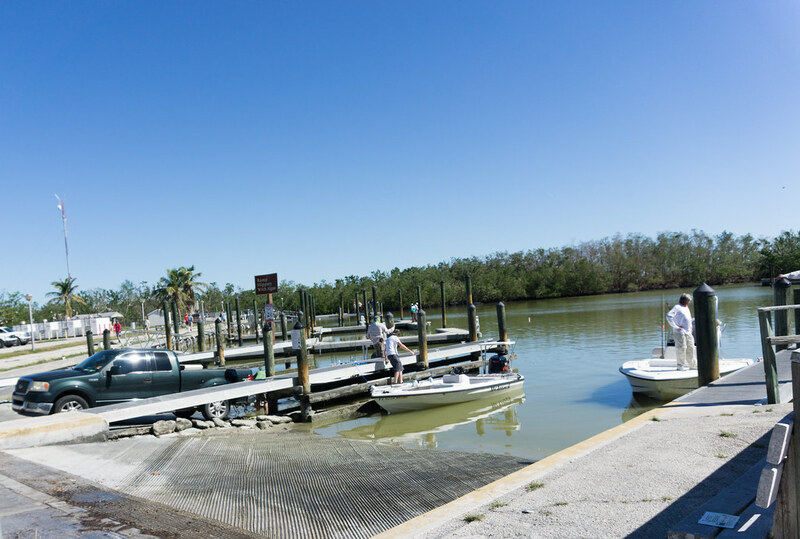 The Flamingo Boat Ramp (Florida Bay side) Was Busy on a Saturday Afternoon, Everglades National Park, Nov. 25, 2017. Sure, the damage caused by Mother Nature was obvious but something distinctively stood out and maybe it’s because the park is still in post-hurricane cleanup: trash. After entering the park, I pulled over to admire the scenery and noticed bottles floating in the water between the grass. At each stop, I noticed some sort of debris, including what looked like debris from a car bumper. Is it likely Hurricane Irma blew this debris in? Or is it a result of recent visitors? I noticed trash cans were limited and I’d say, the entire park is pack in, pack out. The only garbage can I saw was at Flamingo and seemed to be solar-powered but was full to the gills! 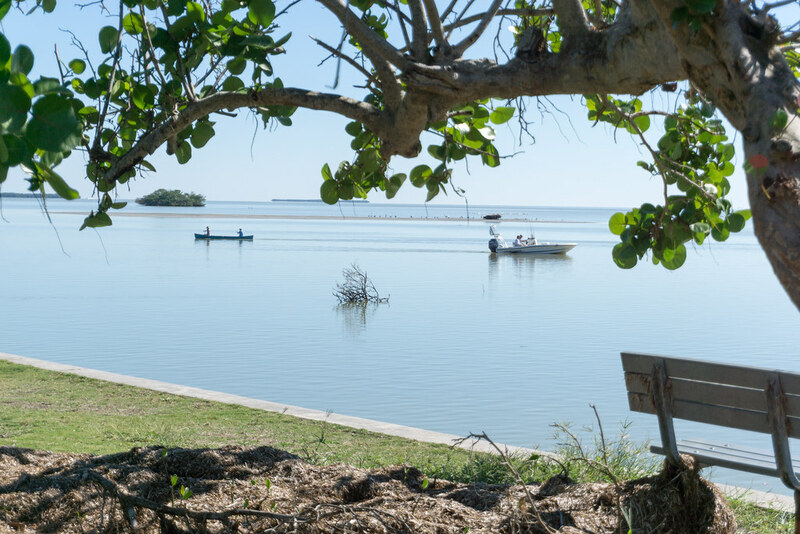 Although There Are No Services Open, People Can Bring their Own Recreational Craft to Enjoy Everglades National Park, Florida Bay, Nov. 25, 2017. “There are no other Everglades in the world,” Marjory Stoneman Douglas wrote in Everglades: River of Grass(1947). She and Ernest F. Coe are two people who were influential in havingEverglades National Park established. The Everglades, and specifically Flamingo, will never be like what I remembered and experienced, at least not in my lifetime. In the grand scheme of things, Florida and the Everglades were here a longtime before I was, and it will be here well after me, at least I hope. 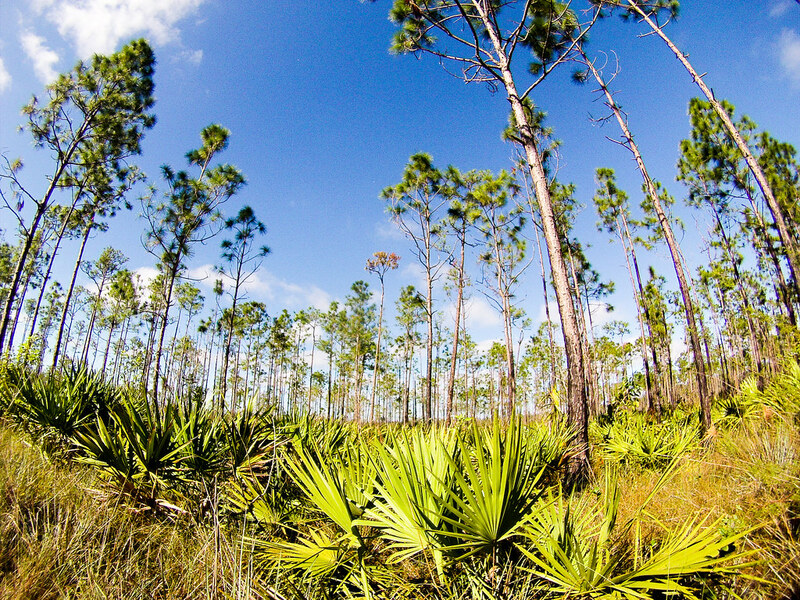 Yes, there are human and natural threats to the Glades. Examples are fresh water has been and is being diverted from flowing into the park which creates a higher saline Florida Bay which changes that ecosystem and has been killing sea grass beds which negatively impacts fishing; the introduction of exotic flora and fauna, such as pythons preying on native wildlife which changes the ecosystem; and of course, hurricanes change the landscape. 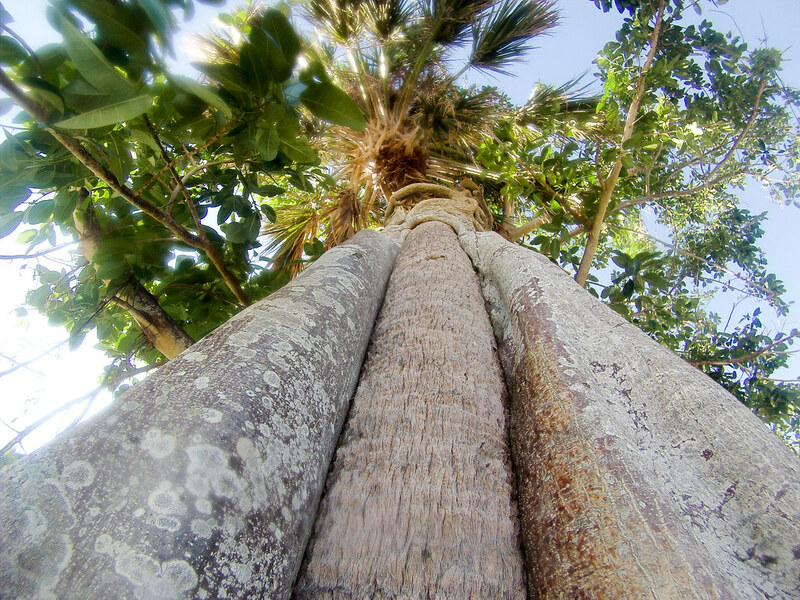 A Strangler Fig Wrapped Around a Palm Tree, Flamingo, Everglades National Park, Nov. 25, 2017. Because there are no other Everglades in the world, change is one of its features that makes it unique. The Florida Everglades has a way of surviving, adapting to change, and living, yet we humans need to be good stewards and do what we can to help it survive since many of our actions have negatively impacted this unique, biodiverse environment. Not only does this mean making smart choices for the environment, it means supporting those people and their businesses who rely on the Everglades for their income. These stewards of the Everglades have an intimate relationship with the park and will do what they can to save it which includes sharing their knowledge with people like you so you will have a better understanding and appreciation of why there are no other Everglades in the world. 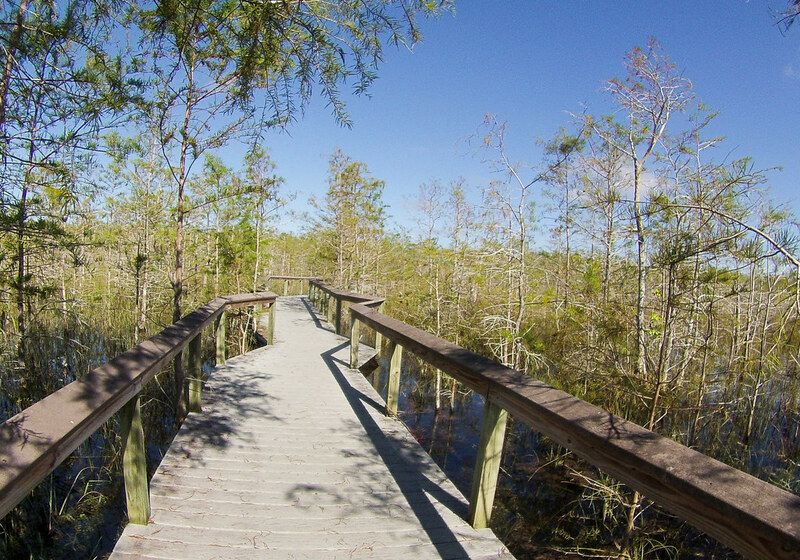 If you are ready to visit, the Everglades is ready to welcome you. 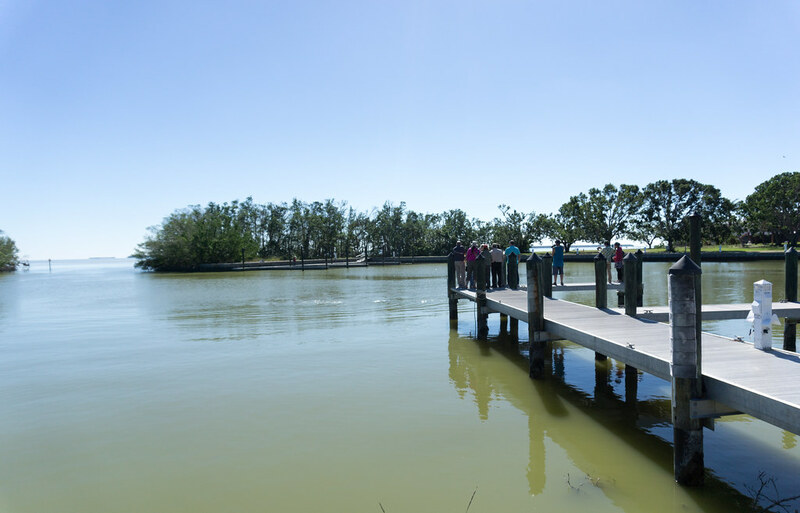 Book your Everglades experience in advance. 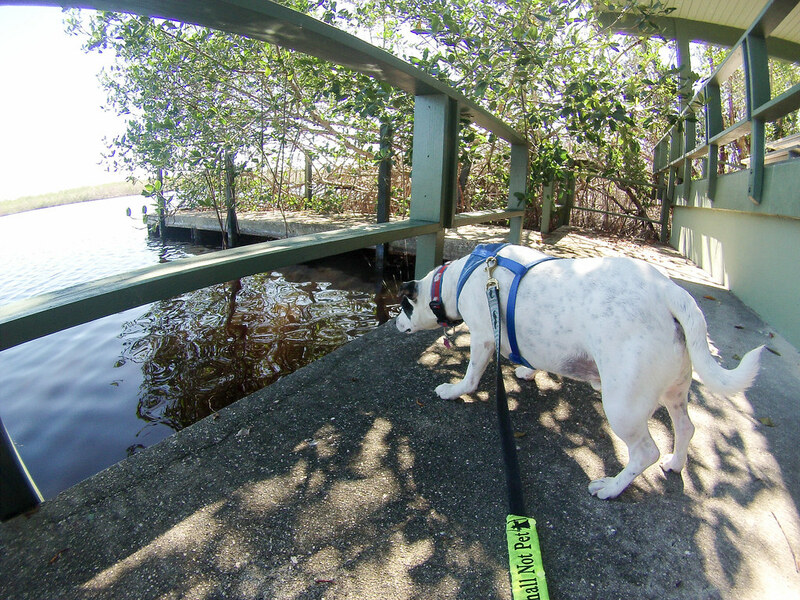 Edited to add (Dec. 6): The Anhinga Trail WAS open during my visit, however, since I had my dog, I did not walk the trail. Thank you so much Jennifer for taking the trip and writing the report. we are planning a trip for Christmas this year and I had no idea what was open. NPS website isn’t updated since middle of November! I hope Shark Valley opens by Christmas. Do you think there is a chance of that? Also, what about Anhinga trail, is it open? Thank you for reading my post. Shark Valley is one of my favorites and I’m not sure what the damage is but I suspect it’s a lot of high water but I cannot confirm that. I would not rely on it being open for Christmastime but if it is, think of it as a nice surprise!